The Tennessee DOT TAMP is available here. The Tennessee DOT TAMP documents Tennessee’s transportation assets in order to maintain and preserve the state's transportation network. 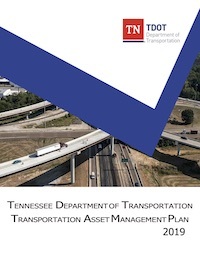 The TAMP also serves as a strategic document supporting the overall vision of the Tennessee DOT. The goal of the TAMP is to create proactive approaches to management of transportation assets with methodical processes that consider the strategic management of the overall transportation network. This document includes the following sections: Financial Plan, Future Demand, Introduction, Inventory and Condition, Investment Strategies, Lifecycle Management, Objectives and Measures, Performance Assessment, Process Improvements, Regulatory and Legislative Requirements, Risk Management.